Retrieve the Fragments of Wuuthrad and wipe out the Silver Hand. With Vilkas as a shield brother, infiltrate the Silver Hand's refuge. Retrieve the Fragments of Wuuthrad. (Optional) Wipe out the Silver Hand. After the death of Kodlak Whitemane, Vilkas is looking for revenge. He wants to go after the Silver Hand for the attack on Jorrvaskr and the further affront of stealing the fragments of Wuuthrad. 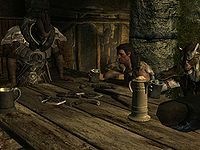 With no questions asked, Vilkas will then act as your follower all the way to the Silver Hand hide-out at Driftshade Refuge, a small fort southeast of Dawnstar. Upon arrival at the fort, dispose of the two Silver Hand members outside: a guard at the entrance and an archer on the roof, then head inside. Not surprisingly, Driftshade Refuge is crawling with hostile Silver Hand members, so take advantage of your follower and kill the opposition one by one. In the two-leveled room with many boxes on the floor, make sure to search for An Explorer's Guide to Skyrim which will add a few map markers for later exploration. It is located on a bookshelf beneath an elk head mounted on the wall. The tunnel north of the room contains a locked door, so unlock it and wipe out yet another Silver Hand. In the next room, a set of spears blocks the entrance but the corresponding lever is easily located right next to the spears. Proceed forward and enter Driftshade Cellar. After the first turn, make sure to loot the hidden treasure chest, then follow the path and make use of the Spike Wall trap to dispose of yet another enemy. Ignore the locked cell with the dead werewolf, activate the trap again and run to the area behind it for another treasure chest. Hit the pullbar on the wall to get back out, and head forward to another room with two enemies and, hidden on a shelf, the Light Armor skill book The Rear Guard. The cellar now turns into a snowy cave, and the next room is in two levels, with a Silver Hand sniper on the ledge above. Kill him and examine the cages, one of them holds a living werewolf, who will attack you if you pick the lock, the other one contains a dead horse. After passing through a torture chamber, the next large chamber contains more enemies, an apothecary's satchel, a coin purse, and two potions on a bookshelf behind the fireplace. Take the only available path, leading back to an initially inaccessible part of Driftshade Refuge. The first chamber contains the three remaining members of the Silver Hand, the One-handed skill book 2920, Morning Star, v1, the Block skill book Warrior, a treasure chest with considerable loot and finally, the stolen Fragments of Wuuthrad. Use the door to the south for an easy escape route, then return to Jorrvaskr. As soon as you arrive, Vilkas will inform you that you should meet up at the Skyforge and pay your respects to the deceased, but now avenged, Whitemane. This will end the quest and start the next one, Glory of the Dead. The shortcut to zoom in on the map point will not work for this quest for some people. The map point is nevertheless visible at the location specified in this article. If Driftshade Refuge has already been cleared, this quest cannot be started normally without a workaround. Before you begin Blood's Honor, wait 30 in-game days after you have cleared Driftshade Refuge to allow that dungeon to reset (you will have to revert to a slightly earlier save to do this). This should allow Purity of Revenge to begin normally upon completion of Blood's Honor. An easy way to check if the dungeon has been reset is to check the doors--if they have all been shut, it is reset (e.g., if the formerly barred door is barred again). The console may aid in fixing this. Click on Vilkas and use the disable and then enable commands, then use setstage c05 0 and talk to him. Another method that has worked is to reset the interior of Driftshade Refuge by typing ResetInterior DriftshadeSanctuary01 into the console. Then go and visit Driftshade Refuge and confirm that it is reset. It should be populated with Silver Hand fighters. Do this before talking to Vilkas, and when you do speak to him the next quest may start. 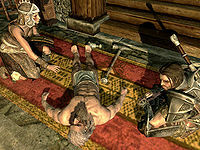 If Blood's Honor has already been completed and this quest won't begin because the Helm of Winterhold miscellaneous quest is active, it is possible to proceed through Driftshade Refuge without killing anyone (use stealth, fear or invisibility as needed) and take the Helm of Winterhold from the chest at the end. Once the Helm is returned to the Jarl of Winterhold to complete that quest, return to Jorrvaskr and the Purity of Revenge quest will begin. ? A possibility to start this quest is by completing the Helm of Winterhold quest by typing setstage favor158 20 into the console before talking with Vilkas. Should the "Retrieve the Helm of Winterhold" quest pose a repetition problem. Simply go to the Jarl Korir, take the quest one more time and enter setstage favor158 20 on the console. This quest shouldn't be a problem anymore. On the console, proceed by tapping ResetInterior DriftshadeSanctuary01. Then return to Vilkas and on the console, enter setstage c05 0. Even after wiping out the Silver Hand, you may not be able to wait (i.e., to end your run as a werewolf) getting the message there are still enemies nearby. ? If Blood's Honor has already been completed and this quest won't begin having tried all other possible solutions the quest may be skipped entirely to avoid any bug. Load a game right after taking the quest Blood Honor form Kodlak, and while remaining in any interior cell type setstage c04 200 then setstage c05 200 and finally setstage c06 00 to start the next quest Glory of the Dead and attend the funeral bug free. ? 10 Vilkas has come with me to avenge the death of Kodlak by wiping out the Silver Hand. 20 Vilkas and I avenged Kodlak's death by bringing ruin to the Silver Hand. The following empty quest stages were omitted from the table: 0, 1. On the PC, it is possible to use the console to advance through the quest by entering setstage C05 stage, where stage is the number of the stage you wish to complete. It is not possible to un-complete (i.e. go back) quest stages, but it is possible to clear all stages of the quest using resetquest C05. This page was last modified on 8 September 2018, at 19:09.